Music is so wildly complex. There are so many different approaches and types of it. This fact is probably what helps fuel frustration that some people have towards music that trends more toward mass consumption and popularity. If you share similar feelings, then you should enjoy the independent spirit of our latest Weekly Featured Artist. Chapter and Verse are an alternative rock quartet from the UK. As is becoming more common, I was introduced to them via my regular work here at Everything Is Noise. I chose their newest EP Glow for review and really liked what I heard. I wanted to know more about them, so I did what any curious blogger would do: I reached out to them in hopes of learning more! Lucky me, they were keen on divulging some information on their concept, process, and purpose. The band has a remarkably simple and practical origin story. 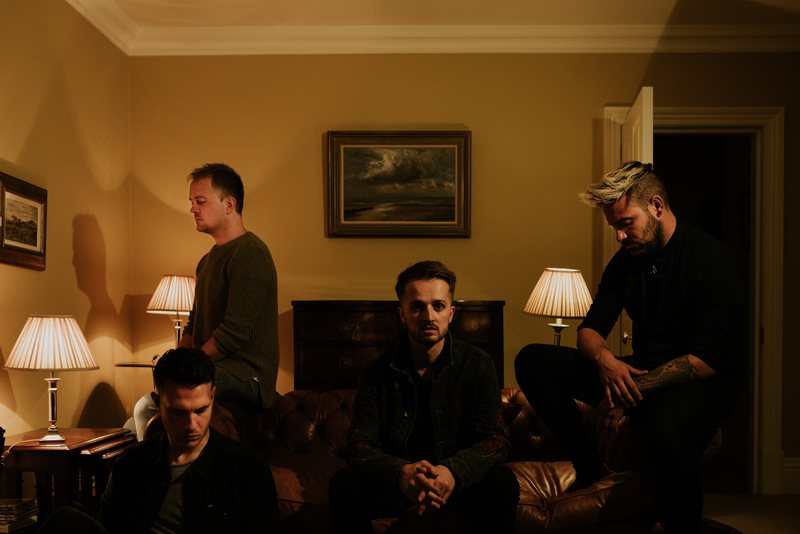 Josh Carter (vocals), Darren Gosling (guitar), Jonny Hopwood (bass), and Ash Morton (drums) needed an outlet: ‘Chapter and Verse was formed out of necessity. Having control of your creative output is our catharsis and without this band, the four of us would be leading unbalanced lives.‘ One of the things that hooked me into Glow, and Chapter and Verse as a whole, was how similarly spirited they were to other bands I love. I often thought of Coheed and Cambria when listening to them. It’s not that they are very sonically similar, because they aren’t, but it’s the personal and relatable life that’s breathed into the music. Released on January 25, 2019, Glow is an act of personal illumination and progress: ‘Certainly throughout Glow and going forward – we’re interested in self-reflection and therefore self betterment. Within this ever-increasingly hostile world we inhabit, we want to practice the mindset of illuminating our own corner of the world.‘ As someone that always strives to be a better writer, friend, employee, and person, this is something that strikes deeply in me as a listener and fan. Even in “The Casket”, the lyrics tell of internal struggles and to push forward and leave negativity and pain behind, having the self-awareness to know that you’re not ready to do so: ‘I’ve tried so many ways to lower caskets with bones of contention, put them to bed for good / But God knows I won’t commit them to the grave, and all because there might be a time when I need to defend myself.‘ This is part of what makes the group’s music endearing. It can be endlessly interpreted, speaking to anyone willing to listen. I counted myself especially lucky to get some time from Chapter and Verse because they were quite the busy bunch this month! In addition to launching a new EP, they were also on an 11-date tour through the UK with rock contemporaries Emarosa (US) and Sun Arcana (UK). Members of Chapter and Verse had seen Sun Arcana live before and counted themselves as big fans, and were quite pleased to find they were just as lovely people as they were musicians. As for the actual tour, well, those rarely go to plan, am I right? ‘The tour itself was a riot. It got off to a rocky start with Bradley [vocalist] from Emarosa coming down with Laryngitis. Rather than cancel shows, our Josh stepped up and learnt their set over night. Josh killed it and gave Bradley the chance to rest up. The show must go on.‘ You don’t have to be a touring musician to be impressed as hell by that! In addition to deeply personal influences within themselves and around them, they also have their musical influences, some similar stylistically, others off the beaten path. The band counts modern rock and pop establishments like Circa Survive, Closure in Moscow, LANY, Paramore, Courage My Love, Death Cab for Cutie, and Manchester Orchestra among favorites, with other artists with a flair for personal storytelling and catchiness like Anderson .Paak and J Cole filling the list out. If you wish to be part of The New Breed, check out Chapter and Verse on Facebook, Twitter, Instagram, and YouTube. You can listen to and purchase Glow a variety of ways through this link.